I have a strange relationship with this game. As a kid, my mom rented Ecco the Dolphin from the local Blockbuster and the game transfixed me with its ambient and beautiful soundtrack. The graphics were amazing, and even though I found the game cryptic and insanely hard, I still loved it. Tides of Time makes Ecco even more difficult by taking away your buffs from the end of the first game, and it makes the story even crazier. 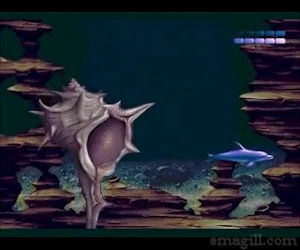 In some levels, Ecco can morph into other creatures. Once again, the soundtrack is amazing and the title theme itself is still one of my favorite pieces of music on the Genesis. If the game weren't so brutally hard, it would be higher on the list, but I did have fun messing around in debug mode (a staple code for many Genesis games) as a kid. 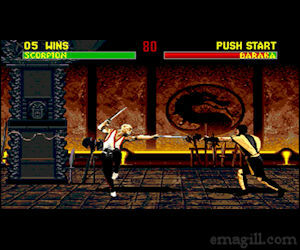 This is the Mortal Kombat game I remember most vividly growing up, and it also made me proud to be a Genesis owner (I didn't get a SNES until years later). I remember thinking I was a cool kid since my version of MKII had blood in it, and I remember thinking the lore behind the characters in Mortal Kombat was amazing (for a kid, all these fighters have a larger than life personality to them). Looking back, I realize that MKII was indeed polished and that they managed to cram a lot of kontent (see what I did there?) into the second entry in what would become a huge franchise. Secrets of Smoke, Jade, and Noob Saibot started so many discussions on the playground when I was growing up. The SNES version may seem a bit closer to the look of the arcade version, but I would pick the grittiness of the Genesis version over it any day. This game is underrated in my opinion and is a very interesting game that mixes a ton of different playstyles of the RPG genre. You have top down exploration with a mini map (with a first person kind of view in the corner), as well as top down action RPG battles for random encounters, and then side action game style battles for the bosses. The soundtrack of the game is very dark and bleak and creates this gloomy atmosphere that permeates the entire game. It really makes you feel that you are a lone warrior going up against all evil it presents in its world. This game is amazing in presentation, and crazy hard when you went to play it. Essentially you play as a comic artist trapped in the comic of his own creation. 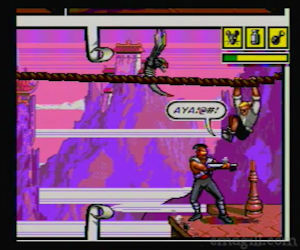 The combat felt sort of like Mortal Kombat but less polished, however the visuals of Sketch Turner (yes that's the MCs name) hopping around the comic pages as well as punching enemies through pages make it a truly unique game that has not been replicated since. Even though the game only has a few levels, these levels are super hard and so I have only managed to beat the game once. Because of its brutal difficulty, I only replay it from time to time, but I am always impressed with how different the game is from anything else on the system. Altered Beast is as classic Sega as you can get. 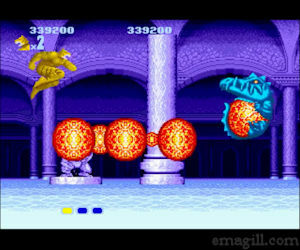 It is a pretty faithful port of the arcade version, in which you play a resurrected greek warrior who punches magic wolves and collects their spirit orbs to become a were-beast in order to rescue Zeus's daughter from Hades. The game is clunky and plays like cardboard, but man do I love it. Everything from the music to the enemy design screams classic Sega. The game is a blast with a friend too, as it has two player co-op. 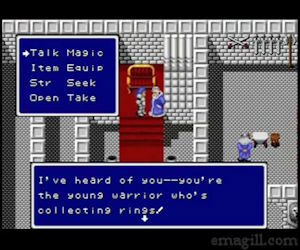 Mocking the voice sound chip was a hobby for anyone that played it with me. WISE FROM UR GWAVE and POWAH UP! are some of the classic lines that could be added to any videogame trivia night. ENLIGHTENED MINDS is a guest blog for emagill.com. If you'd like to contribute your own essay, shoot me an email at emagill00@hotmail.com. I can't promise to put up everything that is submitted, but I will definitely read whatever you have to say and get back to you as quickly as I can. This is a solo operation, though, so patience is recommended.